It’s Blog Hop time again! 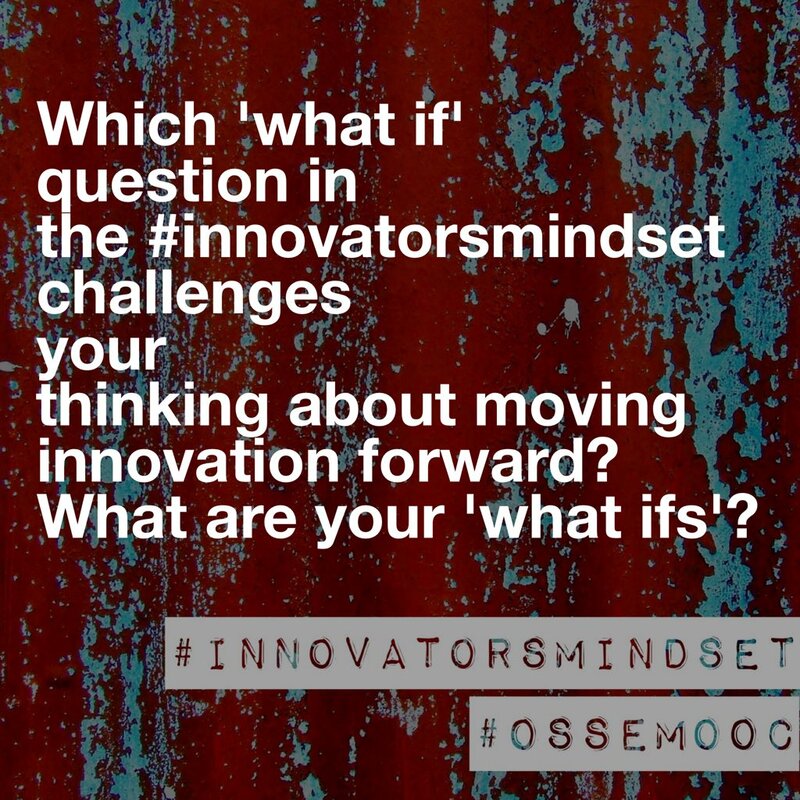 George Couros writes about his “What If’s” in his book Innovator’s Mindset . . .
What if we believed that everything that we had to make great schools was already within our organization and we just need to develop and share it? What if schools always focused on the notion that we should all be “learners” as opposed to “students”? What if we did not only promote “risk-taking” to our staff and students, but modelled it openly as administrators? What if we hired people that did not look at teaching as a “career” but a “passion”? What if we wanted everyone to pursue their dreams in our organization, not only our students? What if we focused on connecting and learning both globally and locally? What if people were always our first focus as opposed to “stuff”? What if we recognized and built on all learners’ strengths? What if we empowered students to make a difference in the world today and in the future? This week we are considering our What If’s and what might be possible if these questions were a focus in our organizations. To be honest, each of these questions resonates with me for different reasons. I’ve decided to blend two of these What Ifs for my post today . . .
What if we focused on connecting and learning both locally and globally to empower students to make a difference in the world today and in the future? My passions is globally connected learning. To me that means connecting kids with learning partners (students, teachers, families, experts…) locally and globally to engage them with the curriculum and empower them to make a difference in the world. What follows is a story about how an experience connecting with the world led me to understand the importance of empowering students to also make a difference in the world . . .
Two years I ago while I was teaching grade 2 “communities around the world” my students and I were travelling the globe and collaborating with kids in 12 different countries via video conference, blog posts, letter and video exchanges. One of those countries was Sierra Leone. 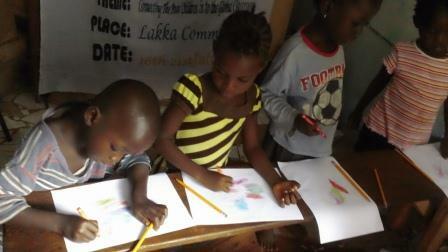 The kids in Lakka, Sierra Leone had to walk 2 hours one way to an internet cafe to visit our blog and read our letters. We exchanged letters with our learning partners for a few months as we learned about life, culture and traditions in our respective communities. The year ended and we celebrated our learning about – and with the world. The following year I contacted Alusine – my colleague and now friend in Lakka, Sierra Leone, to inquire about connecting and learning together again. The letter I received in reply to my request was not what I expected. Alusine shared horrific stories of loss as a result of the Ebola virus. Most of the children pictured in this post lost their lives, and those children who were fortunate enough to survive lost their parents. In an attempt to escape the virus, many people from Lakka left Sierra Leone by boat which later capsized. There were no survivors. Alusine’s community was devastated. Those words ignited the room and soon all students were a buzz talking about how they could help the this community. What inspired me was all of the conversation based around what my students had learned about life in Lakka and how that might help them make a decision about how to help. My kids decided that creating posters showing families how to wash their hands properly, sneeze into their arms, and stop the spread of germs would be the best way they could help. So we did – and the buzz quickly spread throughout my school and soon other classes got involved. So as I come back to my What If and reflect on the experiences I’ve had as a teacher connecting my students with the world, I now understand that the application of that learning – empowering students to make a difference in the world – is what teaching and learning is all about. What if we focused on connecting and learning both locally and globally to empower students to make a difference in the world today and in the future? Check out what other Ontario educators are saying about their What Ifs on the OSSEMOOC site! Note: I recently met Sean Robinson who has coined the phrase connections-based learning #CBL. Sean has recently published a new website that showcases his ideas and experiences with CBL, and his site links to resources like the Digital Human Library as valuable spaces to connect with students and experts around the world. Take a look! Your story about Lakka brings me to tears every time! Sometimes you find a story that you connect with so deeply that you feel compelled to share it out to as many as possible. It is the kind where someone’s special experience powerfully resonates with your own heart, and you have to stand up and say “Yes. This is what it’s all about.” This is that story. – If you don’t connect, you can’t help. – If you don’t share your story with the masses, we all miss out. Thanks, Leigh, for sharing a piece of you and your students, here. The difference you and your students made for the families in Lakka ripples out far beyond what you can see. My “What if”? I can’t help but think: What if we were all connecting like this? Thank you for sharing your thinking here Sean. I completely agree – and the point you make about not sharing your story is such an important piece of the puzzle. And how do we help make this the norm instead of the exceptional. I don’t know you or your students and stumbled on to your story by “accident” but am richer for it. How do we get these powerful stories out into the world to be seen and shared “by the masses” (as Sean comments)? You have done such wonderful work – both with your students and with your blog – I wish we could share it all more widely. Thanks for your story and your “what if”. Thank you for your thoughtful reply. I truly believe that every act of sharing creates ripples and the extent to which those ripples reach others is determined by people like you – people who have the power to continue sharing. As well, I hope you take some time to share your “What If?”. Once we ask the question – we are then in the mindset to begin the journey to make it happen!